We have finally decided to no longer mail out a written form of our newsletter. We just can't afford it anymore. Thank you to those who sent us donations over the years. Rest assured that your help went totally to printing and postage costs. The newsletter updates will hereafter be only here, on this web site. 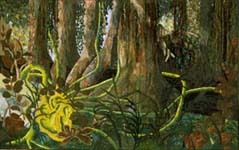 At left: "Heartwood" © 1998, Maya Schonenberger. Miami, FL. 37"h x 60"w. Commercial cottons and blends; hand-dyed and painted cottons; knitting material; rayon, silk, and cotton threads. Machine pieced, appliqued, and quilted. Winner of the 1999 GREEN QUILTS AWARD, presented during Quilt National, 99. About her piece, Maya writes: "Humans will always be part of Nature. Similar to the growth of trees in the rain forest, where in regular cycles, sapwood turns into heartwood, and old, fallen trees turn into nurse trees, generation after generation of humans develop and change our world." Hilary Fletcher is gracious and lets us present our little award at the party she and her husband Marvin give at their home, for the artists in QN. For the third time, we have presented the COVETED GQ award, and hope to continue to do so, every two years. We feel that Maya's piece really speaks to our project's values and energies. Many thanks to her and to the other artists who make quilts which celebrate bringing balance and harmony back to Earth. At right, Robin and I present Maya Schonenberger with the 1999 GREEN QUILTS Award, at the Pizza and Cheesecake Party at Hilary and Marvin Fletcher's house, on May 29, during the Quilt National 99 festivities. Congratulations, Maya! This is the award I handmade for Maya. It's about the size of a potholder. And besides, we can keep people thinking about healing the earth.